FAITH and Hope, the rare conjoined twins born three weeks ago, have died in a Sydney hospital. Simon Howie and Renee Young were with their twins, when they died at the Westmead Children's Hospital in Sydney just after noon on Tuesday. "Our precious baby girls, who gave it a good fight, are headed to the arms of the angels who will give them their wings," a statement from the couple said. 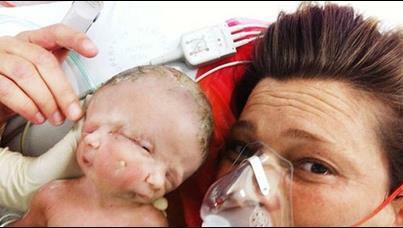 Faith and Hope had an extremely rare condition called diprosopus. They shared a body, limbs and a skull, but each had their own brains and a set of identical facial features. There are about 35 similar cases recorded around the world. None of those babies survived. Doctors discovered the babies' condition during a routine ultrasound at 19 weeks and their parents went against medical advice when they continued with the pregnancy.